Finished off all those raspberries. 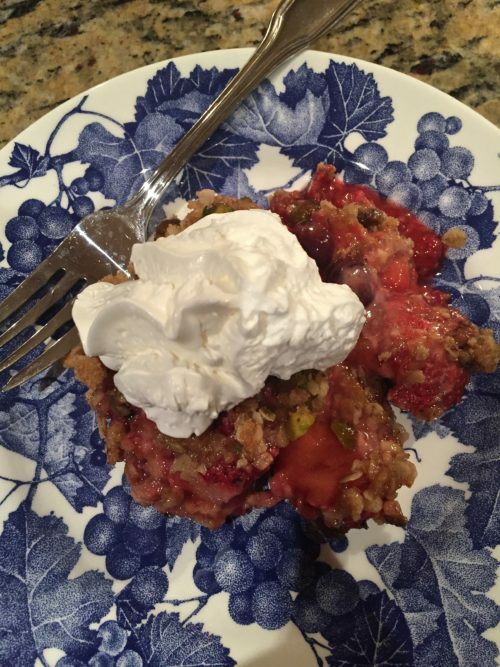 With summer almost here and all those berries starting to come in season, ya need to put this on your list of things to try; especially if you need a good cobbler type dessert to throw together to take to a gathering of friends. I love to pick my own berries and hoping timing is right this year for us to be around when blackberries, strawberries and raspberries are in season for the picking. I’ve given up on picking blueberries or at least to freeze them because I don’t care for them once they are frozen. I guess they are ok in blueberry muffins or bread or cobbler but I don’t like to eat them frozen like I do the other berries. 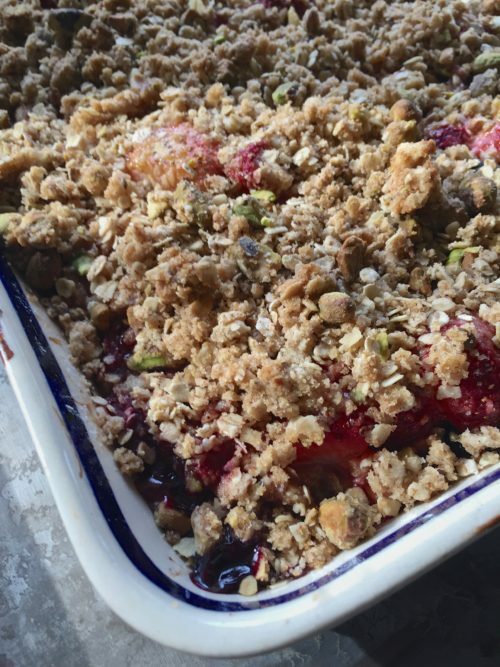 The pistachios are so good in this cobbler; don’t think I’ve ever used that nut in a topping for cobblers before. 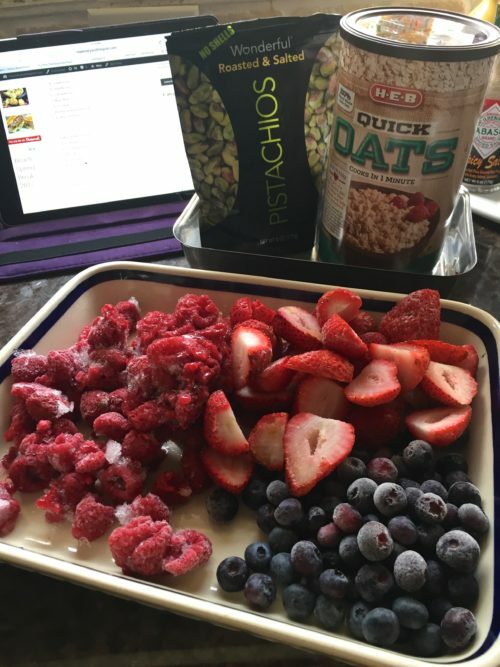 Any kind of fruit can be used in this but I did berries because that’s what I had in my freezer and I was trying to get rid of some of it to make room for this season’s fruit. BLAST FROM THE PAST: These Pepperoni Olive Kebabs are the easiest appetizer ever. Read and look at the olives we saw while in Spain. Put all your fruit into a oven proof dish. 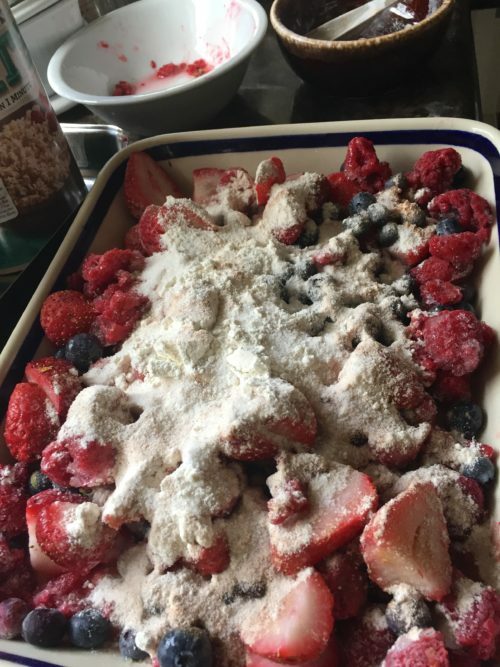 Sprinkle the flour and sugar over the berries and gently toss. 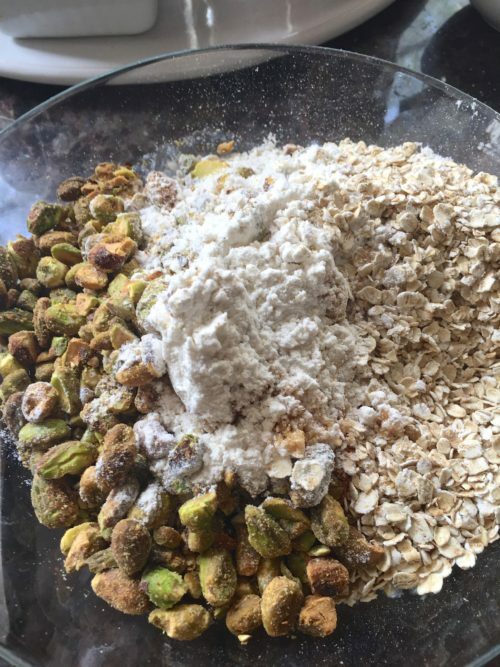 Mix the oats, brown sugar, flour, pistachios and the melted butter. Mix everything with a fork and sprinkle on top of the berries. Bake at 350° for 30-40 minutes or until brown and bubbly. Preheat oven to 350°. lightly grease square or other baking dish that will hold all your fruit and set aside. In a large bowl mix all the fruit and other ingredients for the cobbler. Try not to break up the raspberries. Pour into the prepared baking dish. In another bowl, mix all the topping ingredients until moist. Sprinkle over fruit and then top and bake for 30-40 minutes or until bubble and brown. Remove from over and serve with ice cream or whipped cream. 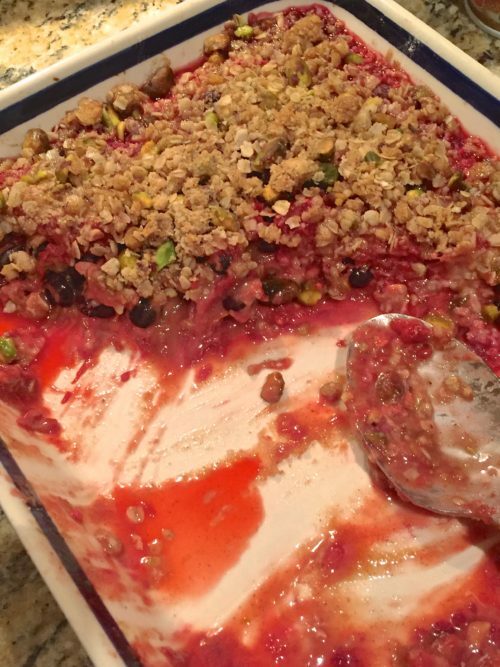 You can use all raspberries or add in some peaches or other fruits. I just happened to have the blueberries and strawberries in my freezer from summer so I used the mixture of fruit.